Year 7 have been working in teams in their PSHE lessons to invent a product that solves an everyday problem, demonstrating their entrepreneurial spirit, courage, ambition and imagination. 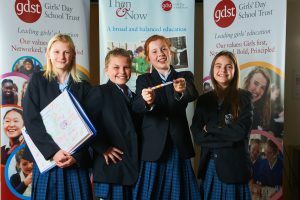 Two of our teams’ ideas were selected for the GDST Invent Competition Final which took place at Northwood College on Friday 25 November. Over 30 competitors aged between 10 and 13 from four schools – Norwich High School for Girls, Nottingham Girls’ High School, Portsmouth High School, and Northwood College itself – took part. The panel – Jasmine Birtles, finance expert, founder of moneymagpie.com and author of 38 books; Narpreet Sidhu, GDST Procurement Manager with experience as a buyer for Disney Stores, Ralph Lauren and Tesco; and Will Wareing, Deputy Director of Education at the GDST – heard 90-second pitches for products as diverse as a clear plaster cast, bouncy trainers, and an app that controls a home alarm system. Our teams were Hava Janjua, Eleanor Day Hartshorne and Mia Lockyer who presented Bedtime Babies and Bella Armstrong, Izzy Slade, Isabelle Conley and Maddi Brown with their Colour Touch Pen. They had a great day out presenting to the ‘dragons’ and getting chocolate money investments for their ideas. The standard of entries and presentations was very high so a huge congratulations to our Bedtime Babies team (which also includes Stephanie Bajaj) who won the overall competition! They wowed the dragons with their cot design which includes a sensor pad connected to a cot mobile which parents can record lullabies onto, and a bottle warmer. Well done girls, we are really proud of your achievement.